Mill Creek Environmental (MCE) has completed a Phase I Environmental Site Assessment on a 450-acres sow breeding farm outside of Tallahassee, Florida. Improvements to the Property include over twenty (20) cinder block/ wooden barns, an office building, a maintenance building, two (2) single family residential homes (one modular home and one wooden home used as a cook house), a small wooden building used as a laboratory, a 6-acre wastewater lagoon, a 32-acre livestock field, over 100-acres of pastureland utilized for land application techniques, and numerous moderately improved dirt roads that encircle the farm and Property. 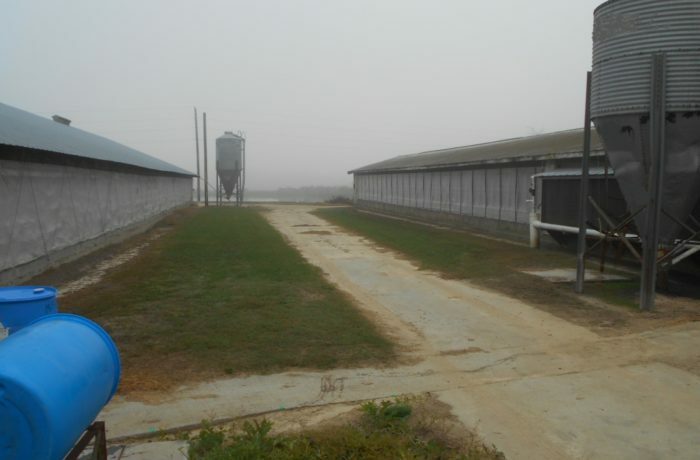 The existing structures on the Property and also the wastewater lagoon were reportedly constructed in 1975, with the exception of two (2) barns. Two 55-gallon drums of hydraulic fluid were recently spilled on the Property while being transported to a storage area. Heavy staining and stressed vegetation were observed in the area around the drums. Although bulk petroleum storage on the property constitutes a REC, the petroleum ASTs were observed to be in good condition and are located within concrete secondary containment dikes. The two 55-gallon drums of hydraulic oil that were spilled on the property also constitute a REC. However, based on the nature of hydraulic oil and the relatively small quantity released, this does not appear to be a significant concern for the property and cost of cleanup should be low. The facility manages wastewater on the property by land application techniques which utilize a six-acre wastewater lagoon and a land application system that applies the wastewater to fields of Bermuda grass using mobile spray units. The wastewater lagoon and spray fields are considered a BER due to the potential cost of compliance and/or closure that may be required in the future. Based on the information gathered and the nature of the RECs identified during this assessment, MCES recommends excavation and removal of the soil impacted by the hydraulic oil spill in accordance with regulatory standards. No additional site assessment activities are recommended at this time.